The web hosting platform consists entirely of Dell servers. 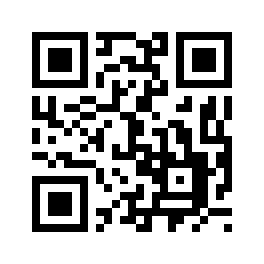 Utilising state-of-the-art technology the web hosting platform is constructed to be second to none. The platform has been designed in such a way that if any server should fail, another server will automatically take over that servers’ workload without any delay. For example, if one of the mail servers breaks down another server automatically comes online, with all the correct configuration, and takes over the work of the failed server. During this period no email is lost. In addition, all data is stored in two large network disk arrays. Data is automatically synchronised between the arrays so that in the event of an array failing the remaining array continues to serve data to the servers with no downtime. The network arrays operate RAID, which is a way of configuring a system so that if a single disk fails it has no impact on the stored data. The network arrays also operate in mirrored pairs which means that even if the whole array fails the stored data is safe. Each array is also backed up each night to a separate backup cluster which is then written to tape and stored offsite. This backup procedure goes above and beyond that of the majority of web hosting companies. 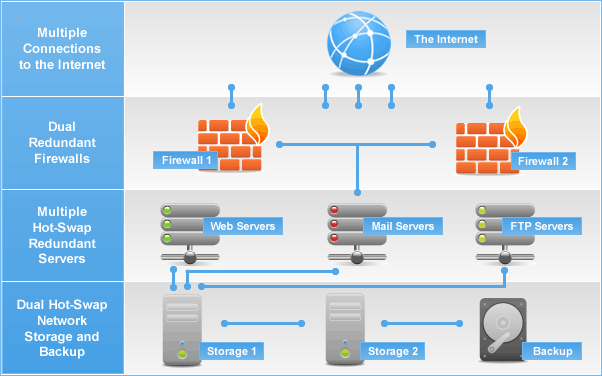 The following diagram represents the web hosting infrastructure. The network operates on industry-leading network equipment from Cisco Systems. All the switches and routers are developed by Cisco. The network is based on 10 gigabit technology, which means that it runs at a speed of 10000 Mb per second – most web hosting networks are limited to much less. The network also utilises 100% CAT6 network cable, which contains four pairs of copper wire and, unlike CAT5, utilises all four pairs. CAT6 supports Gigabit (1000 Mbps) Ethernet and supports communications at more than twice the speed of CAT5e, which is the other popular standard for Gigabit Ethernet cabling. Redhat is the leading provider of Linux open source software. For many years now Redhat Linux has been the number one choice for web hosting companies, not just because of Redhat’s amazing scalability but also because of its track record as the most stable operating system available in the market today. Our systems utilise the latest Redhat server technology which allow the servers to be continually up to date with Redhat system & security patches. Unlike many of our competitors we run Redhat Enterprise Linux, the most stable release of Redhat Linux available and the only version that keeps completely up to date with security patches. 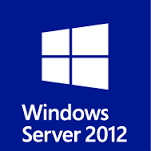 We use Microsoft Windows Server 2012 to power our Windows shared hosting platform. Microsoft Windows Server 2012 is the most advanced Windows Server operating system yet, designed to power the next generation of networks, applications, and Web services. With Windows Server 2012 you can develop, deliver, and manage rich user experiences and applications, provide a highly secure network infrastructure, and increase technological efficiency and value within your organisation. The system operates on a multi-homed network utilising BGP4 technology. What this means is that there are multiple connections to the Internet using different backbone providers. If any connection should fail the other connections automatically take over all the traffic. This makes it very unlikely that we should lose connectivity to the Internet, and also means that traffic moving to and from our network can choose from a range of paths to get to its final destination. This configuration allows network traffic to always take the fastest path.